Morning fear bombs fell on the landscape of my mood all weekend. They knew exactly when I would wake up. Saturday morning just as I rolled over to move my face into the morning sun, I felt the first one drop. It landed in my solar plexus and the shockwave rang down to my groin and up through my ribs and neck. It started with a thought, “I need to write Dmitry.” That triggered a distinct boom in my gut. Immediately another thought came into my brain. Thought. Boom. Thought. Boom— each one adding to a the sense that dangerous intruders were entering my home, and death was soon to follow. These fear bombs aren’t life threatening, but they sure feel that way. The mounting anxiety can be distracting at best, and poisonous when it gets out of control. Most of my anxiety actually begins with the fear feeling followed by a thought that seems to justify the feeling. I have my ways to unshackle them from my behavior when they happen like that, but these fear bombs came in the opposite order, thought first, then feeling. I’m not sure why it’s more distrubing that way, I don’t control either my thoughts or feelings or their sequence, but I’m dedicated to wiggling within them. Morning fear bombs can ruin a whole day. Here are my tactics, and they often work. I’d love to learn some more. Not the perfect prophylactic, the pulling-out method is underrated in my opinion. 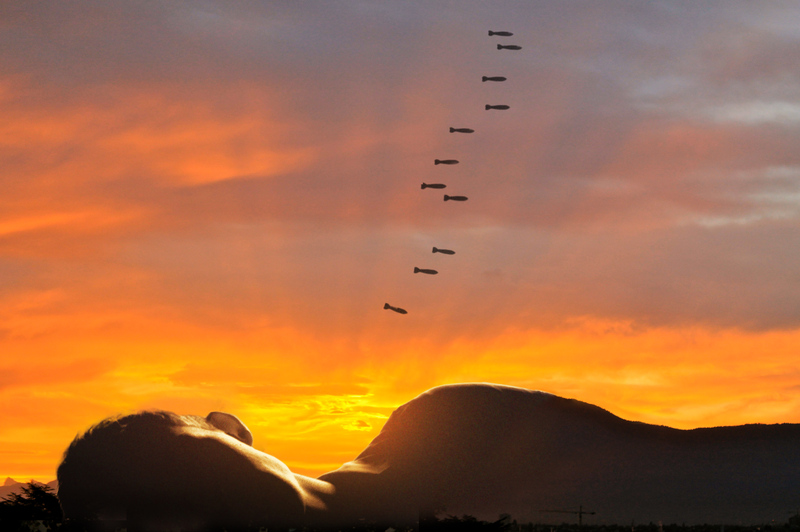 The idea is simple, as the bombs fall, get out of the way fast. Interrupt whatever you are doing. Get your nervous system doing something else that’s just as intense. Here are a few from my repertoire. Laugh. 10 minutes of Louie C.K., Eddie Izzard, or Wait Wait, Don’t Tell are good bets. Call a friend. It’s probably best if it’s someone who doesn’t sympathize. Call someone who requires you to get it together a little. Tell them exactly the sensations you are experiencing. Don’t make up any reasons, just focus on describing the physical qualities in excruciating detail like a nerdy scientist. Dance. Swing has been my cure. Benny Goodman, Glenn Miller, unless that throws you into WWII flashbacks. Then try The Proclaimers. You can’t help but march with conviction, even if you can’t understand a word through their weird Scottish accents. Anything to get your heart rate up. Jumping jacks. I’m always suggesting jumping jacks. Do jumping jacks. “The only thing we have to fear is fear itself.” This oft-quoted quip flies in the face of my poison analogy. If fear is just an object to observe, feel fully, and let pass like weather, then maybe it’s worth drinking it in. Maybe it isn’t poisonous. Can we do that with fear bombs? I’ve done it with other kinds of fear. I let fear hit me before I go on stage. I let it well up when I have to tell someone something difficult. I’m not sure I can do it with fear bombs. Can I use mindfulness to observe and detach from the feelings while I feel them? Yikes! Getting up and doing something about the roots of my fear is the most effective way I know to prevent morning fear bombs. Then, going to bed having successfully addressed the real causes of my worries or at least having taken a few small steps quiets the morning to come. This only works if the fears are based in reality. When I panicked about cash flow, I turned my focus on my money-making business. When the fear bombs were about my marriage, I had the big talk and changed things. Most of the time fear is just fear. Make sure you know it’s about something you can change; then do the work, get help if you need it, figure out what works, and the fear will probably go away. A NOTE ON DESPAIR. I take drugs to deal with what used to be a frequent visitor, Despair. I hated the idea at first. I thought I should be able to fight off the fucker with an awesome therapist, behavior modification, singing, diet, exercise, but I couldn’t and while Anxiety is annoying and sometimes punishing, Despair is out to kill. I brought out all the guns which included trying drugs. I wanted to kill Despair before it killed me. With the guidance of a skilled, loving doctor and many careful experiments dialing in exact dosages, Despair has been banished from my body. Hooray! Do you suffer from morning fear bombs? How do you deal with them?